wherever life takes you, choose positive. If you look around the grocery store, you’ll likely find healthy alternatives to almost EVERY popular snack: popcorn, veggie chips, even cookie dough. But what about pretzels? That’s the question the founders of Positive Pretzels asked. Pretzels have always been a favorite snack of theirs, and they knew they could do BETTER. Positive Pretzels creates great tasting pretzels using clean, quality ingredients sourced from the best farms + producers. As a startup company, the founders knew they needed a strong brand + marketing program in order to compete against the “big players” in the pretzel industry… and they needed something fast, cost-effective, scalable, and easy to maintain in-house. My brand package was a perfect fit for Positive Pretzels. In true startup fashion, the two founders of Positive Pretzels were running the entire show and wearing a zillion hats. With the tools provided during their branding project, they were able to launch their Squarespace e-commerce website and start growing brand awareness through social media - all within their very tight timeline + budget. 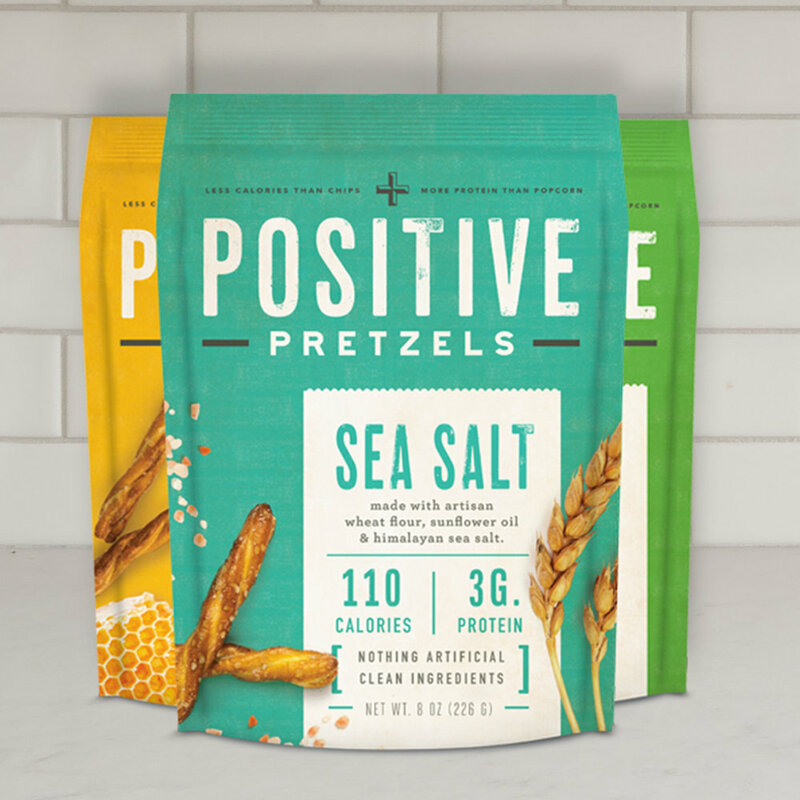 In addition to the build out + training for their marketing assets, I worked closely with Positive Pretzels to build a brand strategy that can scale + grow as they do. I worked closely with the founders of Positive Pretzels to build out a brand strategy that not only matched their vision for their company, but responded to the aspirations of their target audience. Since Positive Pretzels was a startup company who had NOT yet launched, we had a blank slate to work with. All they had was a product, a bag design, and a vision. Using the bag design as our jumping-off point, we built out a brand identity + strategy that lives in the “sweet spot” between their vision for the future of the brand and the needs + aspirations of their target audience. Positive Pretzels provided me with three bag designs as a jumping-off point to build out the entire Brand Strategy. This set the tone for the brand color palette, graphic style, and overall brand personality. Once the Brand Strategy process was completed, Positive Pretzels received their final Brand Book that outlined their Brand Strategy + a basic style guide for their marketing assets. During the Brand Strategy process, we put a lot of focus on cultivating the right brand voice for all branded communications. We worked to create a brand voice that is authentic, wholesome, positive, and transparent - just like pretzels themselves. Working with the Brand Book as my guide, I created a Squarespace website and 25+ branded marketing templates for use on social media, digital ads, and print marketing. Upon completion, I trained their new marketing hire on how to best utilize their marketing templates and Brand Book.